Can I get CME credit? Yes! Our programs will offer CME credit. Individual CME offerings are identified in the CME track on our EventMobi mobile app. No. Though many may find our workshops “therapeutic”, we do not define the professional programs of Happy Doc Summer Camp as offered by Angels of Hippocrates as therapy. You sure can, though space is limited! What happens at Happy Doc Summer Camp stays at Happy Doc Summer Camp! All records are confidential and will remain so at all times. We are here to provide a supportive, encouraging environment where you can let your hair down and relax. Sometimes, schedules change and you may not be able to attend Happy Doc Summer Camp. We have a generous refund policy based on the dates of when you submit a notice of cancellation. We recommend that you purchase travel insurance to protect your investment from unexpected cancellations, flight delays, lost luggage, etc. You can find our comprehensive refund policy in the "About Booking" section. Do we stay in cabins? 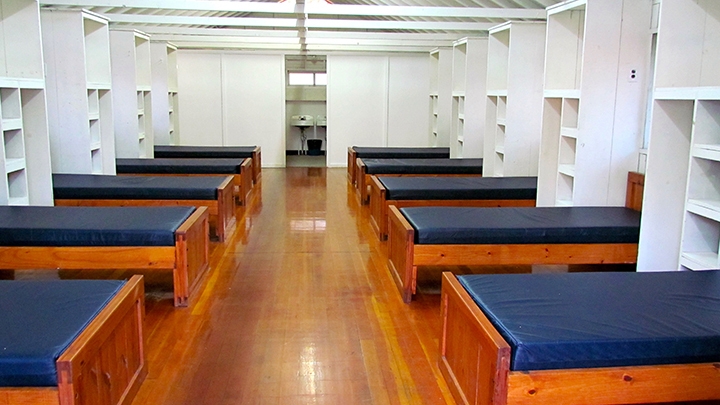 Yes, there are over 70 group-style cabins spread throughout camp. We have a variety of housing options, from double-occupancy to large groups, and a limited number of dedicated cabins for families! If you have friends coming and you want to bunk together, let us know! We can make that happen! Check out the "About Housing" section for more general information, or the "Cabin Housing" section for detailed pricing. Sure! You're welcome to make this event whatever you want it to be. Camping is permitted in most areas of camp, but due to some of the infrastructure of pipes and wires, camping in certain areas is not permitted. Upon arrival, our staff will be happy to help you with finding your perfect spot to pitch your tent. Because this is a summer camp and not a typical camp for tents and RV's (like KOA campgrounds), there are no permanent or assigned tent locations. Walk around the camp and if you find a spot you like under a nice shade tree, go ahead and pitch your tent after you check with the staff. If you do want to stay exclusively in your tent, you will be assigned a cabin for bathroom and shower privileges. Of course! Like the issue of tents, RV's are permitted only in certain locations. Please check with the staff upon arrival to find out the best location(s) for your RV. Because this is a summer camp and not a typical camp for tents and RV's (like KOA campgrounds), there are no permanent RV utility hookups, meaning there aren't any power, water, or sewer utilities. If you need power in your RV, you may be able to run an extension cord to a nearby cabin or other building. For those that stay in an RV, you will be assigned to a cabin for bathroom and shower privileges. Yes, there are a number of local medical facilities within a 10 - 20 minute drive from Pocono Valley. Yes, there are AED's available around camp. If there is an emergency, call 9-1-1, tell the operator that you're calling from Pocono Valley and give them the location where the emergency has occurred, e.g. main dining hall, gym, cabin number, etc. Grab one of the AED's to begin resuscitation and let one of the staff members know. We will have the location of the AED's posted at camp so be sure to look for that after you arrive. Pocono Valley is located in the Pocono mountains of eastern Pennsylvania. It can be cool in the evenings. In fact, it can get cold at night compared to where you may live. At camp, the forecast is posted daily on the bulletin board by the main camp office. Expect that over the week it may rain at some point. Our chefs will be preparing meat dishes along with vegetarian, vegan, and gluten-free meal options at every meal. Just sign up for these options on your registration form so we can get an accurate count for our chef. We'll also have healthy (and some not-so-healthy) snacks throughout the day and desserts served in the evening. And for our insomniacs who get hungry, you will be able to go to the kitchen 24 / 7 and order off a limited lat-night menu, e.g. turkey club and chips, eggs over easy and grits, etc. (menu to be determined). Yes, there is cell phone service in the area. Some providers are better than others and depending on your location at camp, you might find you have better service in some parts of camp than others. If you have any questions about your specific service, please contact your service provider and ask about coverage in Reeders, Pennsylvania. Happy Doc Summer Camp is created with the intent for you to disconnect from the world. That said, we understand that there may be times that you need to check on a patient, sign a chart urgently, or access company e-mail. We very much want you to disconnect and spend time doing the things that you want to do rather than taking care of business. But if you absolutely have to access a computer and didn't bring one, we will have a private office with a computer and phone available. We also offer complimentary photocopying, scanning, and faxing services. What about security for valuables? Unfortunately, no, we do not provide security for valuables. Our attendees are very well behaved, but that's not to say that theft won't ever happen; it's just highly unlikely that it will. We recommend that if you are concerned about securing your valuable items, either lock them in your luggage or vehicle, or purchase a small safe from a local office supply store. Because our event is all-inclusive, there will be little need for large amounts of cash but we understand your concerns for securing keys, drivers licenses, passports, credit cards, etc. The best thing that we can recommend is to find what best that works for you when it comes to securing your valuables. Do the pools close at night? No, the pools are open 24 / 7 for your enjoyment. If it becomes necessary to add chemicals or vacuum clean the pool, we will let you know when that occurs and the duration of how long the pool will be closed. Otherwise, feel free to take a swim at 3:00 am or any other time of the day or night. Please note that there is no lifeguard on duty; swim at your own risk. Is there a gym on-site? Indeed! We have approximately 2,750 square foot of free weights, weight machines, and cardiovascular exercise equipment available for you to use 24 / 7. You're welcome to work out and make use of the equipment anytime. Drinking water is available in the weight room as well so that you can stay hydrated. One of the pre-renovation cabins. One of the renovated cabins. These are pictures of the cabins and the interior of one typical cabin. All of the cabins are summer camp style housing with individual beds, "cubby holes" for storage, electrical outlets, toilets, sinks, showers, and lots of hot water. A typical cabin holds 8 people at capacity. The housing option you choose will determine how many other people are in your cabin. There are both smaller and larger cabins and one cabin more suited for those who have mobility challenges. Cabins are spread over the camp with the main camp amenities near the center. Whether you want to be close to the action or far from the crowd, there are a number of cabins that will be available for you to choose. You can request your housing preference when you register. You are welcome to decorate your cabin as you wish. You can hang holiday lights, drapes, or rearrange the cabin as you see fit for the duration of your stay. All we ask is that you restore everything back to its original condition prior to your departure. So the cabins are being renovated? Yes, and not just the cabins! Pocono Valley resort has been doing significant upgrades and renovations in anticipation of Happy Doc's arrival. We've worked with Howard and the Pocono Valley staff for almost two decades on a variety of programs, and we're very excited to see what they've got in store for us. Sure! At the time you register, you can request to be housed in a specific cabin or with specific people. We will try our best to accommodate your request. Please note that depending on availability of room in a cabin and the time that your request has been made, we may not be able to guarantee specific housing requests. This usually is not a problem unless the camp is full or there is a large group that wants to be housed in a specific cabin or in a particular location at camp. If you have any questions, just ask! Can I move to another cabin? Sure! If for some reason that you're not happy with your cabin or cabin mates, just let the staff know and we'll move you to another location. We keep track of who's assigned to where in case there is an emergency and it also helps us know what open beds there are if people need to be moved or we have last minute registrants. If you move to a cabin of a different occupancy level (e.g., "quad" to "double") you will need to pay the difference when moving. Can we decorate our cabin? Absolutely! In fact, it's encouraged. We want you to have the time of your life and if that means you want to make your cabin more "homey" and festive, by all means, please feel free to do so. You may add holiday lights, hang pictures, posters, drapes, etc. All we ask is that you return your cabin to its original condition prior to your departure. Outside of that, have fun! Can I stay at a nearby hotel? Of course, you can! Contact us for information on hotels nearby. We understand that there might be some that may not like the concept of group housing or sharing their personal space with others and may opt to stay at a local hotel. That's perfectly fine. If that is the case and you do want to stay off camp, hotel costs are not included in your reservation fees and will be paid separately directly to the hotel. Unfortunately, we are unable to offer you a credit or discount for staying off camp. The camp charges Happy Doc Summer Camp the same rate whether you stay on camp or at a nearby hotel. Since this is a summer camp, it's not set up like a traditional KOA campground for RV's. Thus, there are no permanent RV set ups, meaning there aren't any power, water, or sewer hook ups. If you need power in your RV, you may be able to run an extension cord to a nearby cabin or other building. For those that stay in an RV, you will be assigned to a cabin for bathroom and shower privileges. Can I volunteer to host a workshop or activity? If you have a love for a specific hobby, want to share a craft, or have expertise in some subject and want to host a discussion group, etc., let us know and we'll find a time and place for your activity in our schedule. We will also update EventMobi, so that others can find your activity. For these types of ad-hoc events, we do not offer a reduction of registration fees but rather see this as enhancing the experience of other attendees. You'll feel great about sharing your talent with others! Can I volunteer to offset registration fees? While our intent is to offer you an experience where you can relax and unwind, there may be limited volunteer opportunities available that we fill to assist us in putting on a fantastic event. Contact Us with any questions and we'll see what volunteer opportunities may be available for you that may help defray conference costs. You most certainly can! Many attendees are not sure what they would like to do in terms of volunteering until they arrive and see the various needs that we have. If you're one of those that would like to get involved while you're at camp, come and see one of the staff members and we'll gladly put you to work! 1. This is a private event open only to men and women age 18 and over. 2. Still cameras can be used anywhere, anytime, unless otherwise announced. To avoid any problems, please request permission of anyone before taking a photograph. Do not take photos or video of anyone without their permission. 3. No indoor smoking in any facility. Please dispose of all cigarettes properly. 4. No littering; please use available trash disposal barrels for both regular trash and recycling. 5. No illegal substances of any kind on the campground. This is a Drug-Free event. 6. No weapons or firearms of any kind on the campground. 7. No fires except in the designated campfire areas. 8. No pets (sorry about that!). But Howard's dog Riley may be running around, so say hi if you see her! Other than those rules, please enjoy your time at Happy Doc Summer Camp.